My awesome husband says I should post this. I generally find that following his direction works out pretty well, so here I am. Today we ran into a common parenting problem, at least around here. One of our children kept having little tiny sins pop up all over the place. As soon as we’d deal with one, another one would appear. This is something that we encounter with relative frequency, particularly among the more compliant children. No major throw-downs, but just a lot of little tiny weird problems. For instance, my favorite from today, “Sibling X said that they were going to tell Sibling Y that they could use my towel.” Seriously upset over this. Another one was something like, “I’m mad because Sibling X keeps asking what these commas are. I am SICK of it.” Okay then. This is a great indicator that something else is really going on. It’s not the towel and it’s probably not the commas either. It’s something else that’s a lot bigger and much more universal to mankind. Some kind of something like jealousy, envy or pride, that kind of stuff. Rachel Jankovic has a great post on the run-of-the-mill feminine version of this over here. You should read it. It’s pretty important to figure out what the underlying sin issue is, and as the kids get older, it’s vital that they learn how to do this themselves. Today I was hitting a wall trying to help this child identify the hiding sin. They just kept throwing up more wacky little misdemeanors. (“I really wanted a donut this morning.” Me too.) I think I said “underlying” about eighty-six times and then realized that we really weren’t getting anywhere. 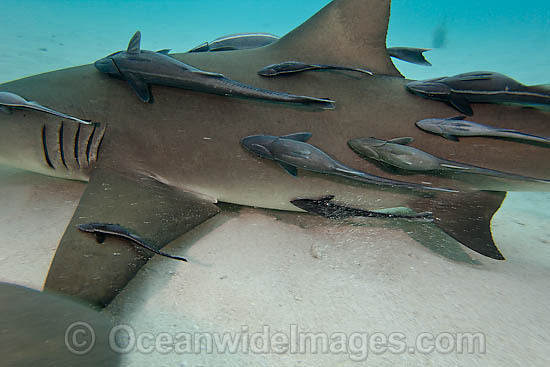 I pulled up this picture on the Interwebz and explained how (some) remora need sharks. It’s how they get around and where their feasts of leftovers and parasites come from. Yum. I then proceeded to name each fish in the picture after one of the tiny transgressions. Then I said that we needed to figure out what the shark was. If we can kill the shark, the remoras will disappear. So anyway, in the hopes that this could help someone else, I offer this blog post. Stop killing remora. Kill the shark. And since the suspense is probably killing you, the shark, may he rest in peace, was envy towards Sibling X. Not shocking to an experienced sinner like myself, but very eye opening to our kid as they figured it out themselves. Good stuff. I think this explanation may resonate with one of my small people. Nothing like a shark to get somebody’s full attention! “Enter the sucker fish.” Brilliant!